According to the San Francisco Chronicle, the "Trader Joe's" grocery chain is suing a guy who has spent more than $350,000 at its stores in the past two years, and many stores have put up his picture in an effort to keep him out, like a casino that caught somebody cheating. The reason is that he then takes the stuff he buys up to Canada, where he resells it at a markup. (Trader Joe's doesn't operate in Canada.) In fact, that's all he sells in his Vancouver store, which he calls "Pirate Joe's." Maybe not the best name, under the circumstances, but has he done anything wrong? 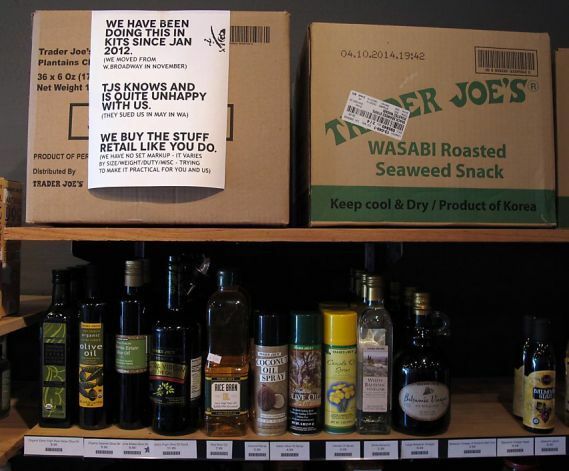 Trader Joe's thinks so, according to a lawsuit it filed in federal court in Seattle. The complaint accuses Michael Hallatt of trademark infringement, unfair competition, false advertising, and a number of similar violations. A motion to dismiss is pending. Hallatt is from British Columbia but lived in the Bay Area for eight years, where he got used to shopping at Trader Joe's. The company was founded in California in 1967, and still has a somewhat 60s/granola feel to it. (Its first private-label product was actually granola.) Now there are about 70 stores nationwide, many in California and the U.S. Pacific Northwest. The products are great, which is presumably why Hallatt can make money selling them at a markup even though he self-imports them, literally driving a van into the U.S. every week, loading it up, and then driving back to stock Pirate Joe's. Since Trader Joe's decided to start opposing this, his excursions have gotten longer and more difficult. The Chronicle relates one incident where he tried to shop in disguise. He was in a nearby parking lot "putting on a leopard muumuu, earrings and flowered flip-flops [he was probably in the SF area at the time] when somebody called the police," afraid he was about to rob the place. "My nail polish was not even dry when three cops showed up," he said. But it's not like these are stolen goods. Once you buy something, don't you have the right to resell it or do whatever you want with it? Is eBay illegal? Well, there is something called the "first-sale doctrine," on which I am not an expert (these people are) but which generally speaking means that a seller only has the right to control the first sale of a copyrighted or trademarked item. This apparently gets tricky with regard to digital rights and "gray-market" sales, but at least according to Greg Owen, an expert cited by the Chronicle, Trader Joe's doesn't have much of a case given that the two businesses don't operate in the same countries. There conceivably could be an issue with consumer confusion, but that doesn't seem likely here since, after all, the store is called "Pirate Joe's" and doesn't make any secret of the fact it's reselling the chain's goods. That's the business model, in fact. Plus, again, they don't operate in the same countries. Actually, the name is not "Pirate Joe's" anymore. After the suit was filed, Hallatt scratched off the "P," so now it's just "Irate Joe's." It does seem like the thing to do here, if Trader Joe's doesn't like the pseudo-competition, is for it to open a store in Vancouver and undercut Hallatt's prices rather than filing a lawsuit. It would not comment as to whether it has any plans to move up north, but that seems like the free-market way to settle the issue.